Want to beat razor burn? Then take a match to it! I’ve long been a fan of alum – the old (and I mean old) treatment for razor cuts and nicks – for several years now. Used since Egyptian times, it’s an absolutely brilliant astringent, aftershave product and a natural styptic, stopping bloodflow and closing wounds almost instantly. 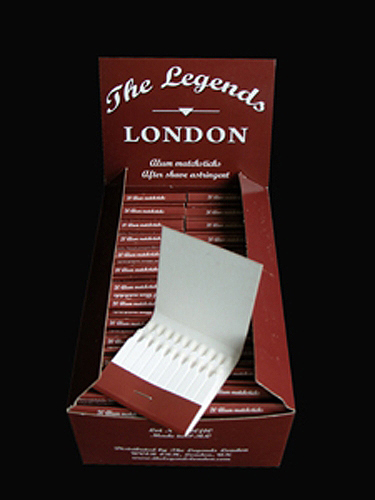 The traditional alum blocks are excellent but these novel, disposable ‘matchstick’ versions from The Legends London are a little more practical and hygienic and are ideal for travel too. You simply moisten the tip of one with a little water and apply to any nicks, cuts or razor burn. If you’re one of those clumsy shavers who always leaves the house covered in bits of loo paper these are a must so give them a try.